As some of you may be aware my father passed away yesterday around 6:00 A.M. 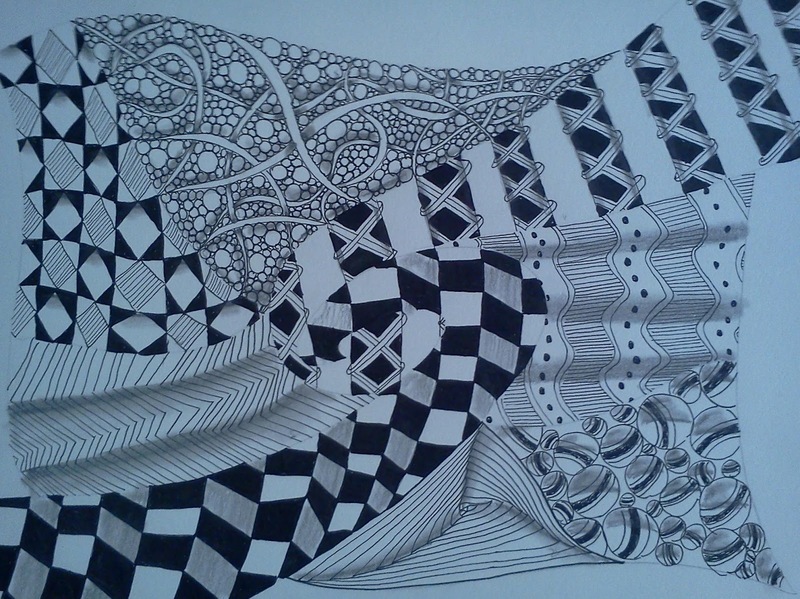 I felt the need to sit down today and create a piece of Zentangle® Inspired Art for him. I was not sure what I would do, so I started like you do with any tangle. First I added a border. Then a string, the string ended up with a spiral type pattern, with six other areas around the spiral. This made my decision for patterns easy, I decided to make the spiral represent mom and dad finally joined together again in the eternal dance. The other six sections would represent each of the six kids. 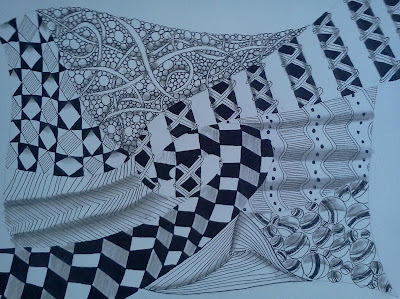 I selected a tangle for each section that started with the first letter of each persons name. I stuck with the original 106 patterns that are in the Guide I have. Dad: (John): Jonqal - Starts with Jon, and looks almost like a dance floor. Mom (Vivian): Vega - Creates a feel of pillars to to, and mom was the pillar of the family. Here it is, I hope you like it wherever you are dad. beautiful! praying for your and your family. i like your wording "joined together again in the eternal dance." how beautiful! I am so very sorry to hear of your loss, Roy. You've created a beautiful tribute in their honor. You and yours will be in my thoughts and prayers through this difficult time. I am sure your Dad is smiling down. Your tile has wonderful movement to it, fabulous shading! He is proud! This is really beautiful, Roy. What a wonderful memorial. I hope you're holding up okay. It is indeed a great tribute to your dad, Roy, combining the entire family. What a lovely way to honor your dad and your whole family. Beautiful to see that your love for your mom, dad, brothers/sisters makes such a great work. My condolances. I wish you and your loved ones strength and much nice memories. I'm sure your dad is still with you in spirit and is very proud. My most sincere sympathy. What a beautiful tribute to your father and family.